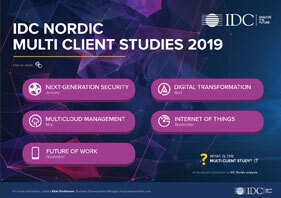 Customized products based on existing IDC research, new quantitative and qualitative research designed and produced in partnership between clients and IDC Nordic. Research delivered in formats like whitepapers, presentations, video or webcasts. Customized Research projects covering aspects of total addressable market, end user expectations to new technologies, technology use or digital transformation. Deliveries are designed to support clients' strategy and planning processes as well as communication or go-to-market strategies. Speaking engagements, workshops and briefings are important deliveries for the Nordic Research Team. IDC's depth and breadth of technology research is unparalleled. Our 1100 expert analysts offer global, regional, and local reports on technology and IT industry trends in over 110 countries. Reports are sold as single publications or in programs. IDC Nordic provides local expertise on technology and industry opportunities and trends in Denmark, Finland, Norway and Sweden. IDC helps IT professionals,business executives, and the investment community make fact-based decisions on technology purchases and business strategy. More than 1,100 IDC analysts and consultants analyze the future of IT, telecommunications, and consumer technology markets worldwide, regional and local.